Native apps may be the current vision for what mobile services and games should be, but a number of companies are pioneering HTML5-based web apps as a more rounded alternative. One such outfit, China-based game firm Wozlla, has landed a $2 million investment from PE firm Greenwoods Asset Management to open its development technology to third-party developers worldwide. Co-founded by former Opera engineer Zi Bin Cheah and other gaming industry figures in 2013, Wozlla has developed an IDE (integrated development environment) that allows game and app developers to create powerful, HTML5-based apps in an easier way than ever before. Plenty such HTML5 services exist already, but Cheah said that Wozlla’s IDE is the most sophisticated to date… and it is touting games that it developed itself to make that point. Wozlla used its IDE, which is not yet publicly available, to create three titles for Chinese users. The titles are available via QQ Zone — Tencent’s web-based gaming service with over 650 million users — while there are also native app versions that share the same HTML5 codebase. 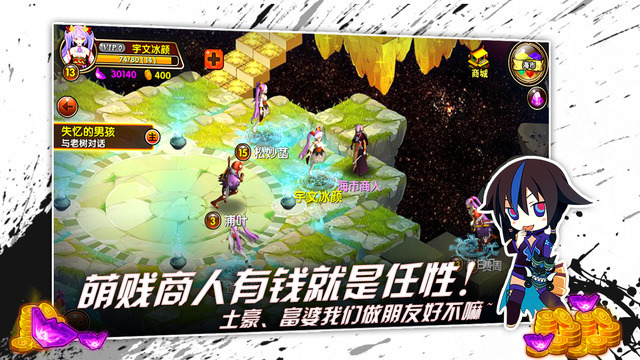 Its latest game — 时空召唤, there’s no English version — is featured within QQ and Cheah said it has been a hit with users. Beyond performance, HTML5 apps are favorable because they are more easily discovered and shared — i.e. not ‘locked’ inside an app store — and translate well to messaging apps, which are hugely popular in Asia. China’s top chat app, WeChat, has over 500 million active users across the world, mostly in China. The key problem is one of reputation, Cheah argued, since HTML games have traditionally been very basic, they are often merely scaled down versions of fuller native apps. Wozlla’s own games are designed to show off what is possible, and stoke interest in the IDE in advance of its release. China, where Alibaba, Tencent and Baidu are pushing HTML aggressively and users are comfortable with web apps, is an ideal place for the startup to begin, but it is targeting international gamers and developers. “We’ve built very sophisticated MMO games using HTML5. The industry hasn’t seen anything this heavy or full-scale on mobile to date — it can even run on low-end phones like [Xiaomi’s $150] Redmi — the performance is really up there,” Malaysian Cheah, who is China’s World Wide Web Consortium chair, added. Wozlla is planning to make its IDE totally free to developers, and instead make money from its games. The company, which is anchored in Beijing with a development office in Mexico City, is planning to raise additional funding again “soon,” according to Cheah. That raise would go towards helping develop its technology, games and raising its headcount beyond the 30 staff it currently employees.